Timing how long an interaction takes. So my courses have to be timed for credit. I have an interaction which include several slides and pathways. I want to be able to make sure that the participants spend a certain amount of time going through the interaction or repeating the interaction to see different results. Is there a way to make sure an interaction takes a desired amount of time? I'm not sure if this is what you're looking for but this is how I implemented it. Using start and time you can perform the calculation you need. I'm new to Storyline, and not familiar with JS. How would I go about doing that? Add triggers to your interaction. Hello, Berno, your solution is quite cutting edge, could you share the story file ? I tried to add js trigger on my slide, but failed. Thanks Berno. So can I just copy and past what you put in the first post into triggers at the beginning and the end of the interaction? How would I go about doing the calculations.... Sorry for so many questions. I really have no experience with JS. Yes, you can copy and paste the JS code in triggers. You may want to divide by 1000 because the start and end time is in millisecond. Hello, Sam ! How did you achieve it ? Please kindly share your story file. Hello, Berno. Could you screenr how to use your js code ? And here ..... is the storyline file! Many thanks, Berno! Good job. Another problem--how could I go about achieving remaining time by using JS in this case as Sam did to add it to each slide? Sorry to trouble you ! So, I successfully implemented a trigger that shows how much time was spent on a previous slide when the Learner clicks the next button - and to display the time on the next slide. Essentially, I copied what you did, Berno, but using the next button instead of Submit. What I really want to do is to have a counter that displays a number of seconds count on the current slide. So, nothing would be clicked, it would just count up in seconds. And I'd reference the count inside a text box. I'd searched the forums a while back for this but didn't find exactly what I was looking for. Perhaps I missed it. Does anyone know how to do this? You'd need to do this with an interval to repeatedly update the second value. I'll test one out to make sure there's no funny business or side effects and post in a bit. Probably a typeo, but gsStart is a Storyline variable, not a trigger. If there is a way to fire a trigger in Storyline, it would be by setting a value in a variable to which a trigger is set to fire on that value. Steve's suggestion of an interval timer is the right idea. I look forward to seeing it implemented. Sam, yep was a typo. And I DO understand the difference between triggers and variables ... really Tx for proofing/editing. Don't want to lead people down the wrong path, nor do I want them to think I don't know my whatchamacallit from my elbow. Steve, tx so much. As I mentioned in another thread to Nancy, I'll need to add this to my ToDo list. In the meantime, looking forward to your post. Oh, there's no rush. Just something I had in mind. And I know you're busy. Here's a quick and dirty example. I'm using a text variable to catch the value but you could just as easily use a number for logic inside of Storyline. Some cool concepts at work here. Noteable are the establishment of global functions that make it easier to start and stop the timer. It also continues to run between slides if you don't stop it. The value in the setInterval call "1000" is milliseconds. So that's a 1 second tick. Thanks a lot, Steve, It's wonderful ! The global functions idea is great. It allows you to experiment / test the JS code after publishing. Just alter the code and refresh your browser. Saves a lot of time compared to publishing after every code change. And you could edit the code in a JS savvy editor. After each publish copy the altered story.html over the newly published one and copy your .js file to the story_content folder. Didn't know that. Great tip! Steve, this is great! Thanks so much. Definitely s/b a verified answer IMHO. 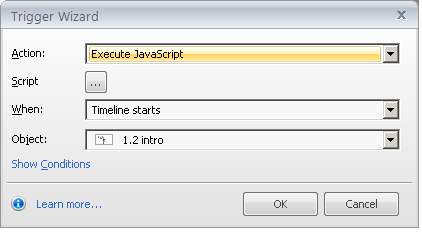 I did change the Set function to when the timeline starts, and put it on the slide master. And the buttons are working. I'm contemplating making a Screenr on this at some point, with your permission, and of course referencing this thread and you, since all I did was copy and paste. But I'm thinking others might like to have this. It's beautiful! So clean. And cool that it will run between slides. Haven't looked at that part yet. Sam, I haven't had a chance to look at yours yet. Tx for contributing. Sure, thing Rebecca. I'm not sure how initializing the functions on each slide (declaring, really) will affect the slide to slide timer. Should be OK (since I think it's just declaring the functions) but I haven't tested it. If it mucks up, let me know. I'll make an adjustment that'll help. "I've extended Steve's code to add another variable that records ela..."
"Here's a quick and dirty example. 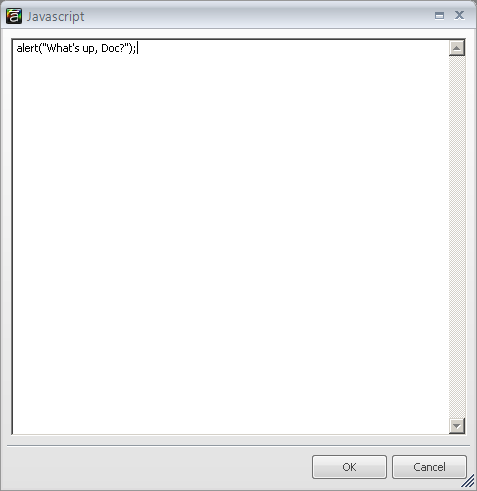 I'm using a text variable to catc..."
"And here ..... is the storyline file! gOOd LucK!"